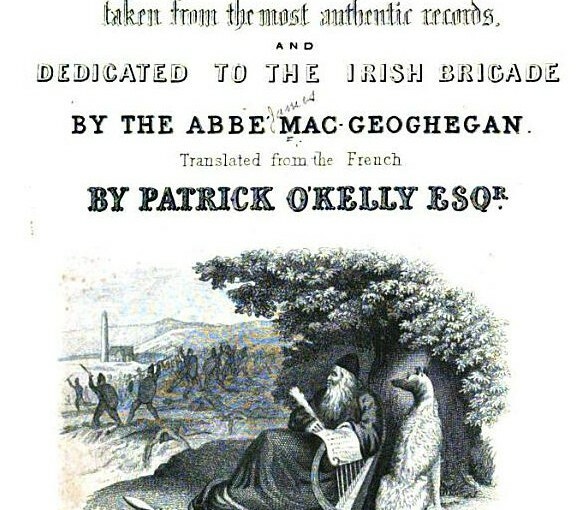 This site has a wonderful list of free eBooks for Irish family history. They are not under copyright as they are old. Some gems here. Good reading on a rainy day. There are nearly 350 eBooks listed at this site with links. Most are 19th century with some from the previous century. 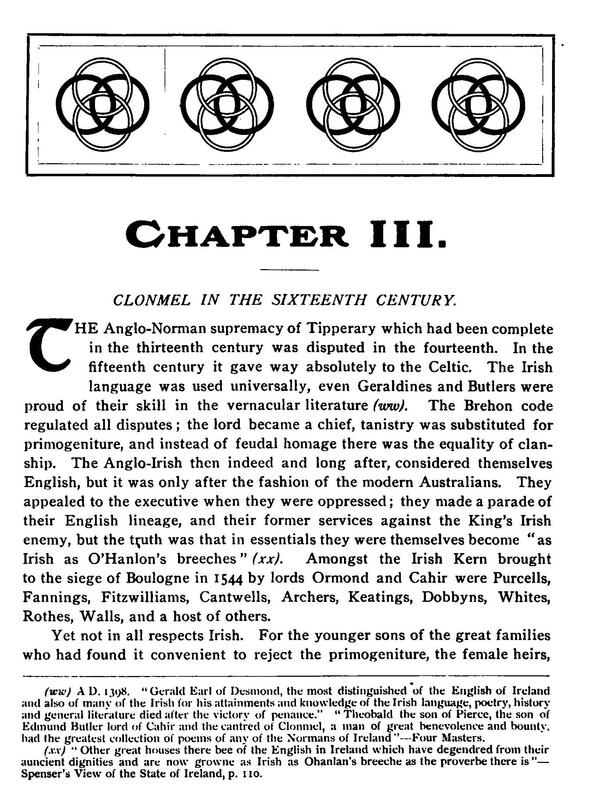 The History of Clonmel by William P Burke published in 1907 can be easily read online at archive.org The pages below mention Anglo-Norman Fannings in the 12th and 16th centuries in Co Tipperary Ireland. 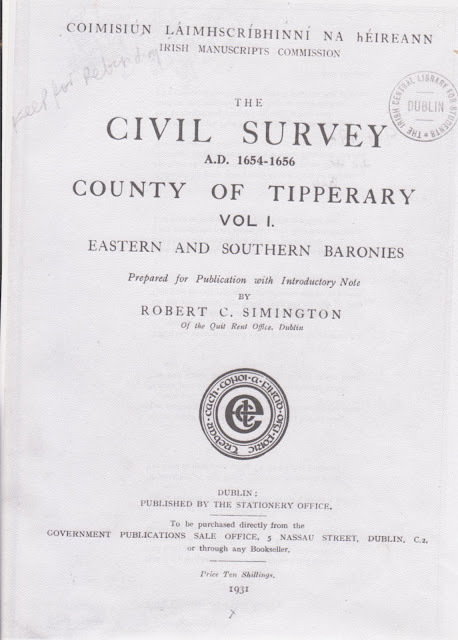 Source: “The Civil Survey AD 1654-1656 County Tipperary Vol 1” by Robert C. Simington. Can be read at askaboutireland. 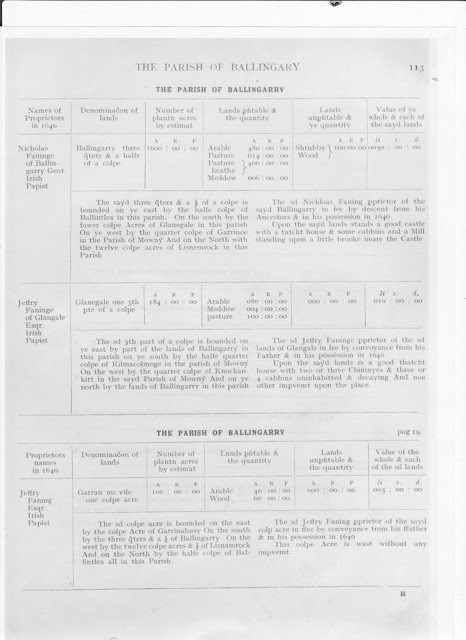 These maps are from the very interesting and informative Ballingarry Parish site and show the area that the Fannings came from. They show the relative proximity of Ballingarry to the Thurles area where the Fannings lived from the mid 1700s to the present day. Richard Fanyn (Janyn) was among the first of the family in Ireland. He was a witness to Geoffrey FitzRobert’s charter to Duiske in 1204 [Duiske charters, no. I.] 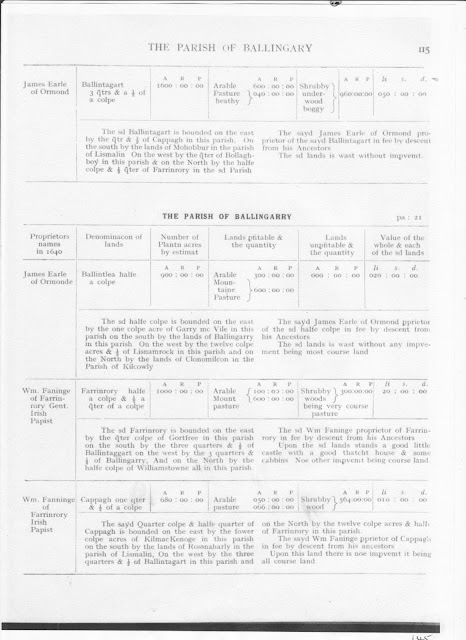 As Richard Fannynge he witnessed the charter of William Marshal I to Kilkenny between 1207 and 1211 [Chart. Priv., p.34 ; Liber Primus Kilk., p.74]. He was killed fighting on the side of Richard, Earl Marshal, in 1234 [Cal. Doc. Ire., i. 2212]. 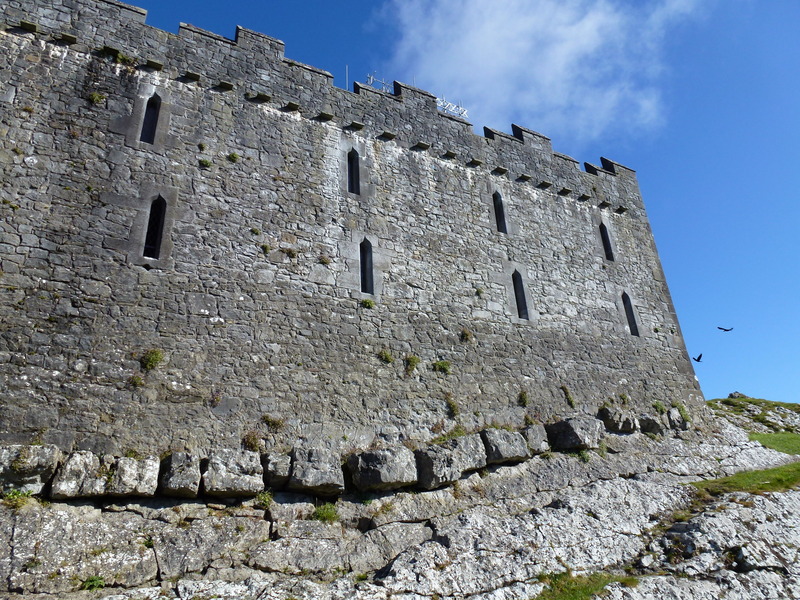 Richard may have been the original enfeoffee at Clomantagh, barony of Crannagh, Co. Kilkenny, as suggested by the descent of the 1/2 knight’s fee there. In the 1317 feodary Thomas de Fanyn (Fannyn) had succeeded to the half knight’s fee at Cloghmantagh. He was still there in 1343 when his lands in this neighborhood are mentioned [Ormond Deeds, i. 764], but was dead by 1348 [Ormond Deeds, i. 808-10]. The 1247 feodary (The de Valence Purparty) was taken from “Chancery Miscellanea“, P.R.O., London (File 88/4, no. 70), collated with a list in the Calendar Patent Rolls. The 1317 feodary (share of Hugh le Despenser and Alianora his wife) was taken from “Chancery Miscellanea“, P.R.O., London (File 9/24). Variants of this records (possibly of a later date) are from the British Museum, Additional Manuscripts MS. 4791. 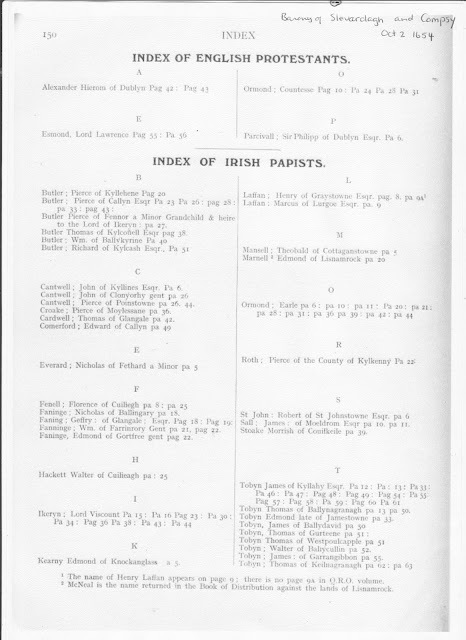 Primary sources:: Knights’ Fees in Counties Wexford, Carlow and Kilkenny, Irish Manuscripts Commission, with commentary by Eric St. John Brooks, Dublin Stationery Office, 1950. Calendar of Ormond Deeds, Volume I, Edmund Curtis, ed., Dublin, 1932. 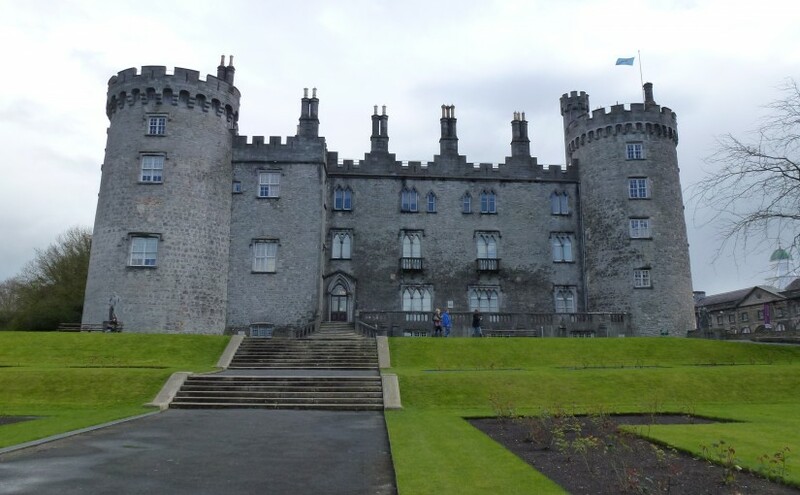 January 27, 1584/5 – Bond, by Richard Butler of Powleston, Co. Kilkenny, gent., and Morerteghe O’Riane of Ballyclaghine in the same, gent., to the effect that they owe 300l. to Thomas, Earl of Ormond, on condition that William Fanyng, son and heir of James Fanyng, late of Balyclaghin, his heirs and assigns, and all other persons seised or to be seised to his and their use of the moiety of the towns and lands of Ballymclaghin and Ballytarsny, Co. Kilkenny, whereof William Fanyng, father of said James, was in his life-time seised, shall abide by the award of Gerald Blanchvild of Blanchvilston, Robert Forstall of Kilfiragh, etc., concerning the right, title, and interest of the moiety of said towns, now in controversy between said William Fanyng and the Earl of Ormond. Information compiled by Dennis Walsh. 1305- Grant by Eustace le Poer to William Fanyng of the manor of Mayobyra, Aug. 23, 1305. 1347 -Writ to the sheriff of Kilkenny touching a contoversy in law between Amicia de Carew, defendant, and Thomas Fanin, Plaintiff, concerning the manor of Cleomentach, 1347. 1430 – Grant by J. Fanyn to Thomas de Sancto Johanne(St.John) of messuages, land,etc. in Haltonwrstoun and Balispedegh, Aug.2, 1430. 1439-Notarial deed concerning the legitimacy of Thomas and William Fannyng, Lord of Mohobbir (Co. Tipperary), Aug.4,1489. 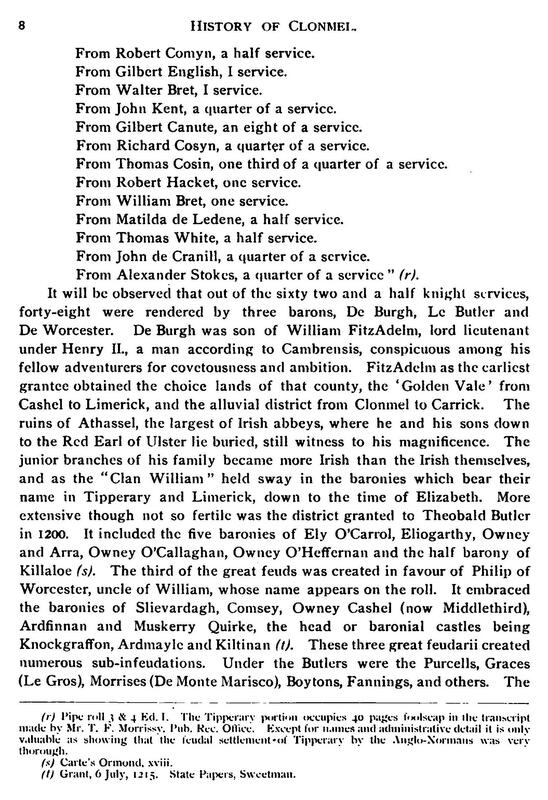 1512-Grant by Geoffrey Fanynge to Sir Piers Butler of the town of Balicoyne, Co.Tipperary, Sept 8, 1512. 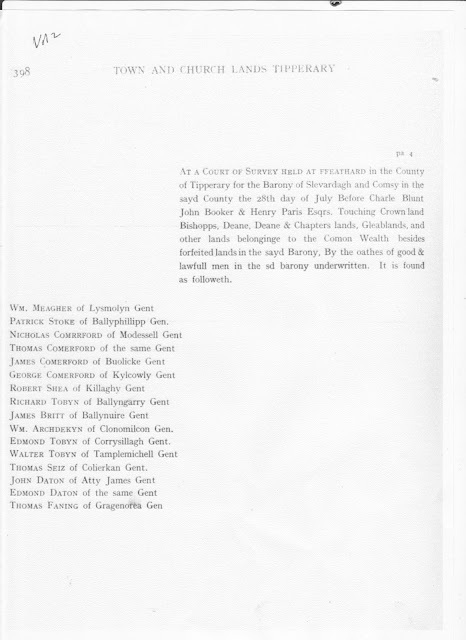 1519- Grant by Geoffrey Fannyng to the Earl of Ormonde of all his lands etc in Ballycoyne, Gossescroft, Garryfynke, Codeston, etc Co Tipperary Aug 12 1519. 1521- Grant by Geoffrey Fannyng to the Earl of Ormonde of all his lands and tenements Ballyghoyn, Ballyntaghyrth, Grageyrysen and Codestoune, Co Tipperary, Dec 10 1521. 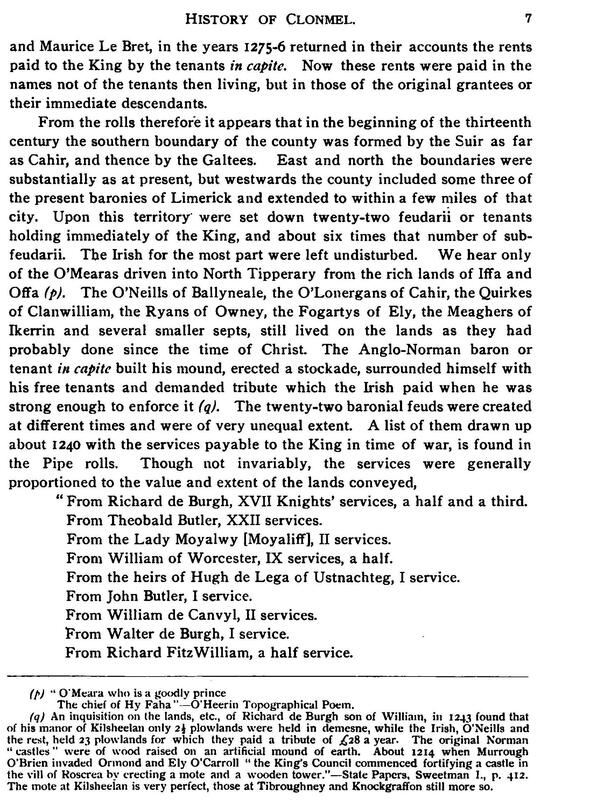 1544-Grant by Oliver Fanyng to the Earl of Ormonde of all the messuages, lands, etc.of Mohobbir and Shancourte, Co. Tipperary, in exchange for lands in Ballihoggon and Croanebeg in Co. Kilkenny, May 10, 1544. 1551- William Fannyng fitz Oliver of Garynegrye and James Fannyng of Garansillaghe, kerns, at Lisnalyn killed one Donald O’Shee late of Modesshell, footman. Inquisition at Clonmel. From Calendar of Ormonde Deeds, 5th Edward VI(1551). 1557-Grant by the Earl of Ormonde to Richard Mares and Katherin Fannyng his wife of the wardship of Edmond Warner alias Marnell, May 1, 1557. 1578-Grant by the Earl of Ormonde, through his attorney, Richard Shee, to John Fanning of a mill called Hospital Mill in Carrick(-on-Suir), May 22, 1578. 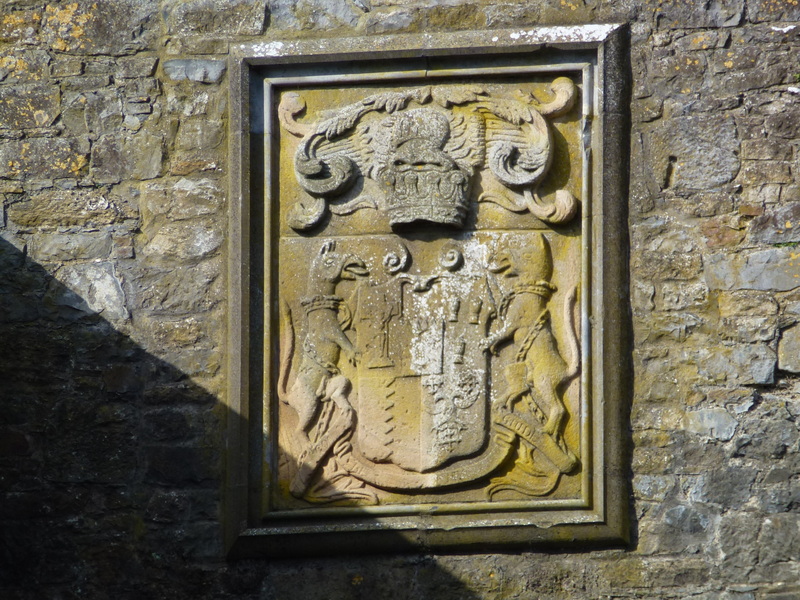 1579-Grant by Edmund Fanning to the Earl of Ormonde of half of the towns of Ballymaclaghne and Ballytarane, Co Kilkenny, Dec 20 1579. 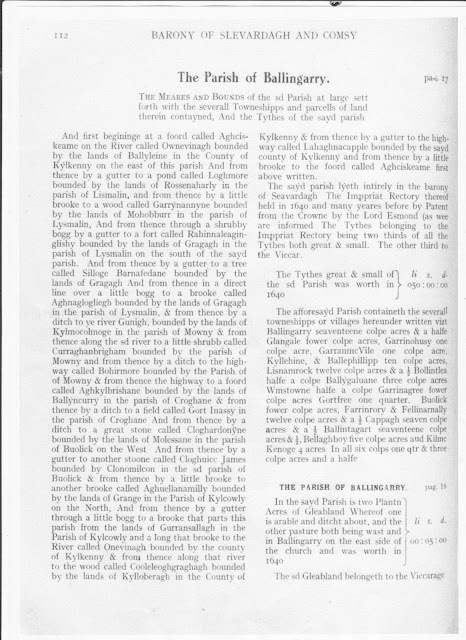 1585-Bond by Richard Butler and Morerteghe O’Riane to the Earl of Ormonde on condition that William Fanyng shall abide an award concerning the title to a moiety of lands in Ballymclaghin and Ballytarsny, Co Kilkenny, with the award, Jan 27, Mar 3, 1585. 1625-Grant by Clement Fanning to his daughter Joan Fanning of a half plowland of Dromona and a chamber in the castle of Ballycahill, Co Tipperary, citing a grant by Fanning to William Kennedy and others, June 20 1625. 1659- Jeffery Fannying Esq. and William Fannyng gent. 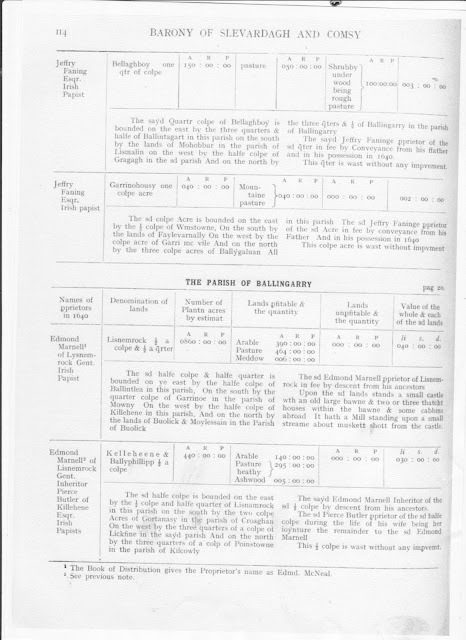 are listed in Pender’s Census of Ireland 1659 as living in the townland of Ballingarry in the Parish of Ballingarry. 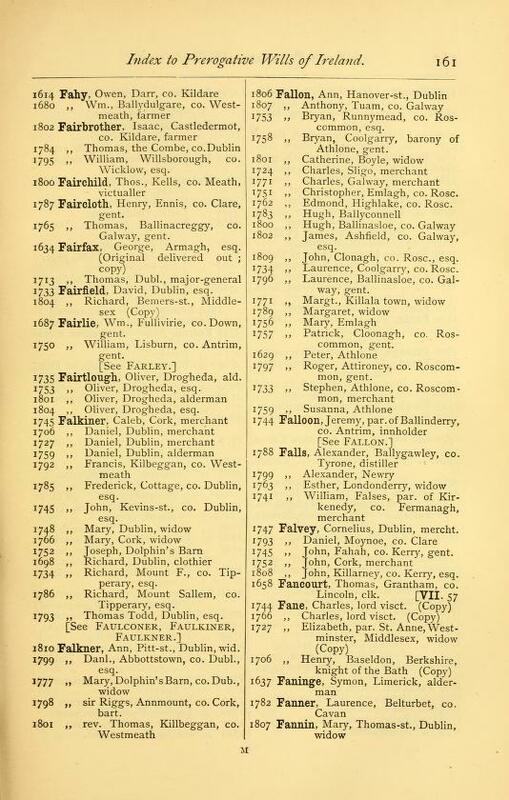 “The lands of the present Catholic parish of Ballingarry comprising the civil parishes of Ballingarry, Mowney and parts of the civil parishes of Lismalin and Crohane, were owned by twelve people c. 1650. Of these twelve, five were Butlers, either closely or distantly related members of the most important family in the region. 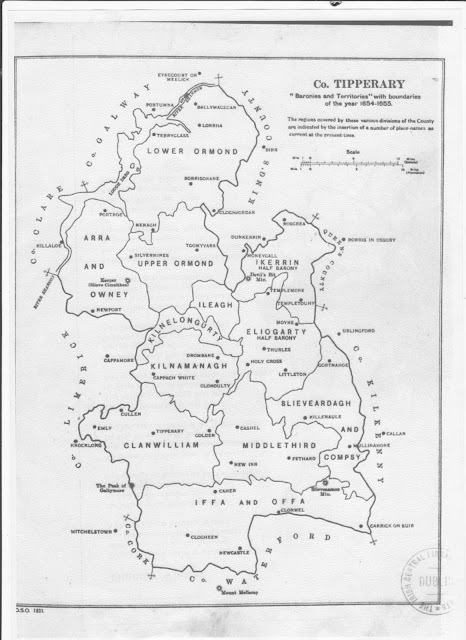 The Butlers owned well over half the land of the parish. The largest landowner in the parish in the mid seventeenth century was the non-resident Earl of Ormonde who held a total of 4,600 acres which was but a small portion of his total landholding. 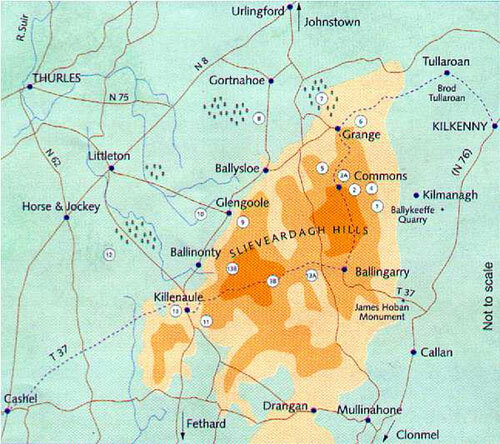 The Earl and Countess of Ormonde directly controlled over 85,000 statute acres in County Tipperary alone. 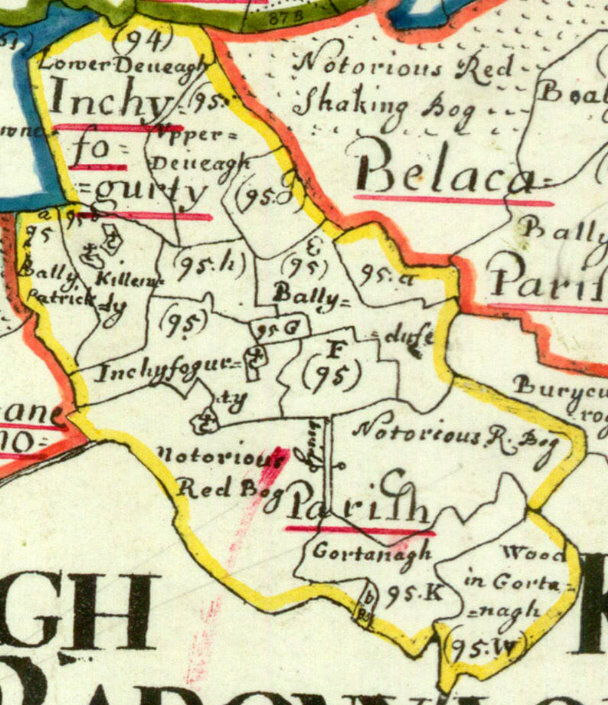 The Earl’s holdings in Ballingarry were as follows with the acreage given in brackets, Ballintaggart (1,600), Mohober (1400), Rosnharley (Harleypark-200), Gortnassy (100), and Boulintlea (Boulea-900). 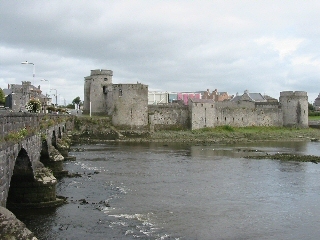 Pierce Butler, Lord Viscount Ikerrin resided at Lismalin where his solid castle can still be see (as can his castle at Clonmichlon in Gortnahoe parish). He held the townlands of Lismalin(664), Gragagh(700), Ballygalvan(400), Shangarry(360), The Islands and Gragaugh(598), Garrynagree(410), Garrynoe(500), Knockankitt(200), Shangarry(400), making a total of 4,232 acres. Again this was only a portion of his 26,700 statute acres in County Tipperary. Thomas Butler of Kilconnel held Crohane(1600) and Ballincurry(180) totalling 1,780 acres. Pierce Butler of Callan held 800 acres at Williamstown and William Butler of Ballykerrin held 300 acres there. 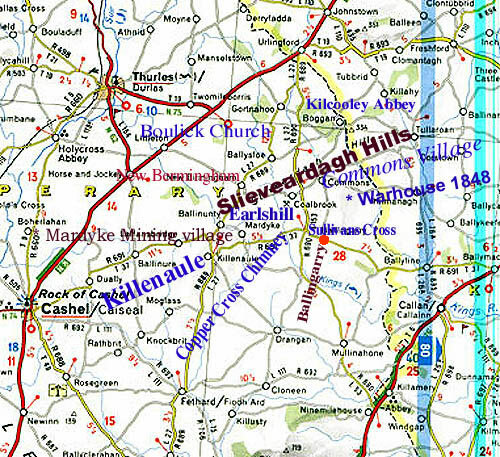 People bearing the Butler name thus controlled 11,712 acres in the Ballingarry area. In comparision to the Butlers, the Fanning Family, who were also of Anglo-Norman origin, were of minor importance though they were well established in Ballingarry holding 4,454 acres. 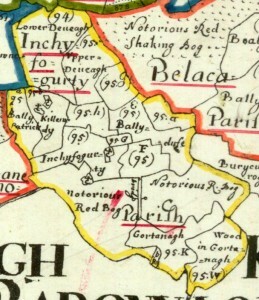 Nicholas Fanning held 1600 acres at Ballingarry. Jeffry of Glengall held 474 acres consisting of Glengall(1184) Grawn(100), Ballaghboy(150) and Gortnassy(40). 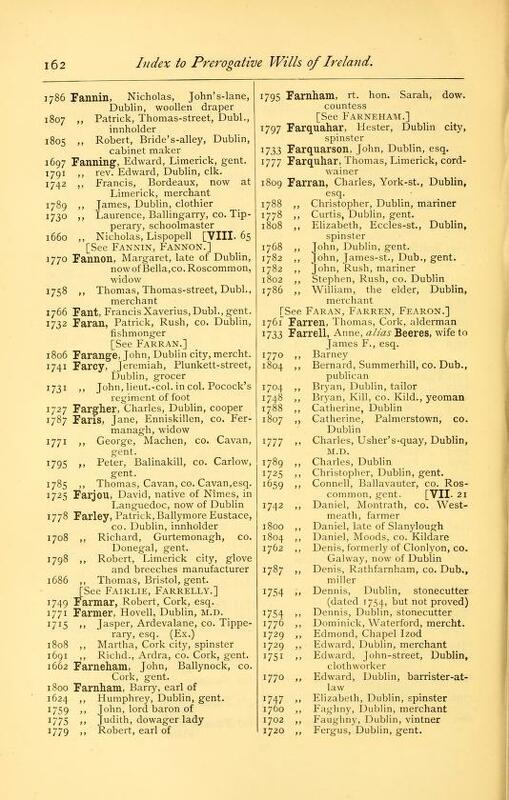 William Fanning of Farrinrory held 1,980 acres: Farranrory(1,000), Cappagh(680), and Kilmackenoge(300). Edmond Fanning of Gortfree held 400 acres therein. Between 1650 and 1850 landownership in the parish completely changed. 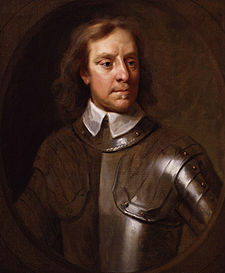 The Anglo-Norman families of Butler and Fanning (invariably described as ‘Irish Papists’) who had supported the native Irish in rebellion against the New English in the 1640s were dispossessed during the Cromwellian (if not the Williamite confiscation’s). Fanning of Ballingarry was executed. Viscount Ikerrin (with all his tenants and retainers) was transplanted. Ballingarry Castle was recorded as being in the possession of Nicholas Faninge of Ballingarry in 1641. Faninge was part of a powerful land holding family in the parish of Ballingarry from the medieval period to the seventeenth century. The castle was probably a tower house and residence of the Fanning’s. Ballingarry medieval church functioned as the parish church. 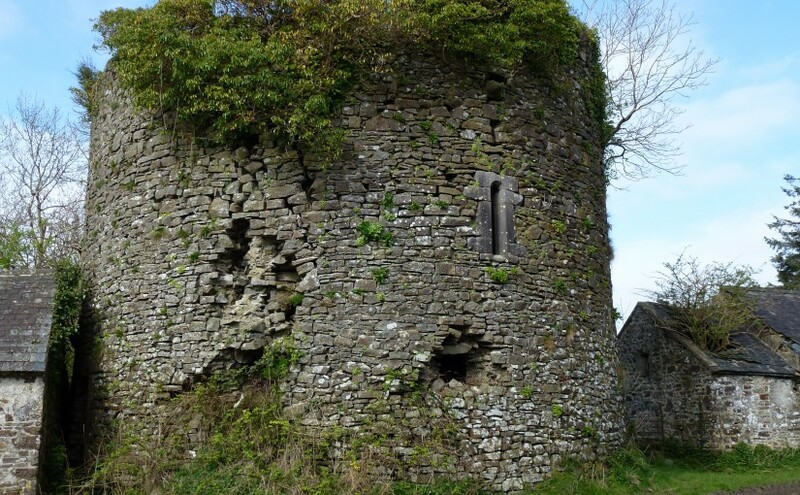 The church appears to have been in ruins at the end of the fifteenth century but was reconstructed, possibly by the Fanning family whose Ballingarry tower house was nearby. Ballingarry settlement was associated with the Fanning Family in the later medieval period. 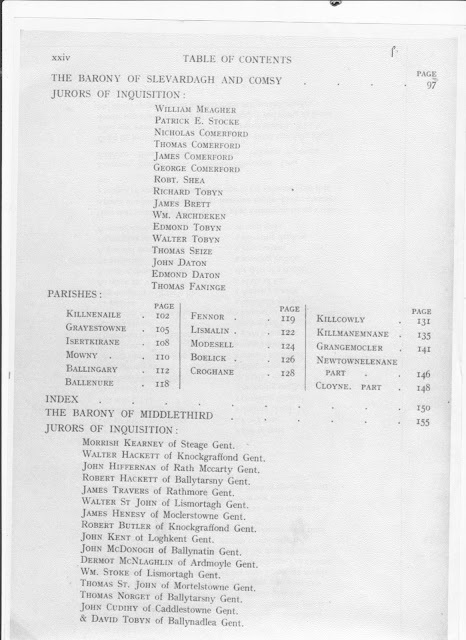 In 1512 Geoffry Fannyng was described as the Lord of Ballingarry (Curtis, E. 1932-1943 Calendar of Ormond Deeds, Vol. IV, 71). Geoffry Fanning was probably the free holder called to the Liberty Court of Tipperary in 1508 as a juror (Curtis, E. 1932-1943 Calendar of Ormond Deeds, Vol. IV, 329). The castle of Ballingarry was probably built by the Fannings. 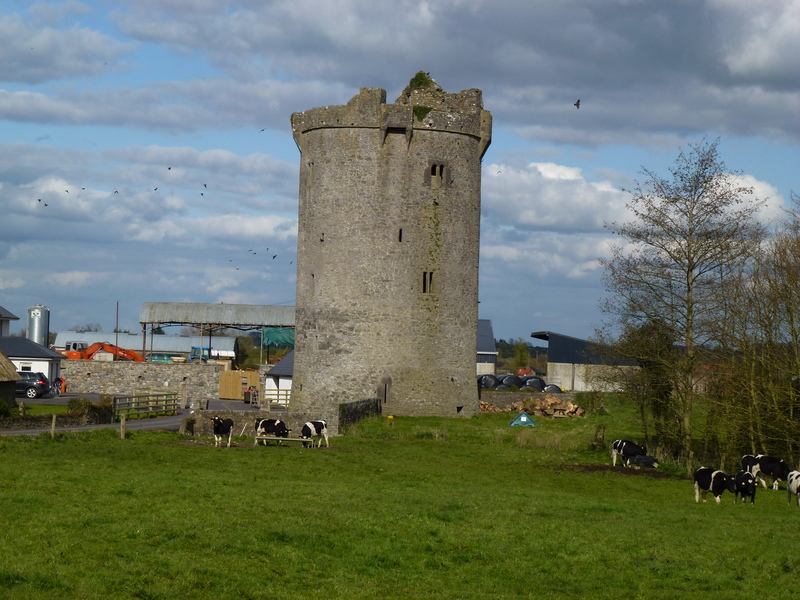 In 1654 Nicholas Faninge, an Irish Papist was recorded as the proprietor of Ballingarry and the settlement at the centre of the parish was described: “Upon the sayd lands stands a good castle with a tatcht house &amp; some cabbins and a mill standing upon a little brooke neare the castle.” (Simington, R. C. 1931 The Civil Survey AD 1654-56 Co. Tipperary Vol. I. Stationary Office: Dublin). The Fannings were one of a few families to retain their land after the Cromwellian confiscation’s. In the census of c. 1659 a Jeffry Fannying Esq. 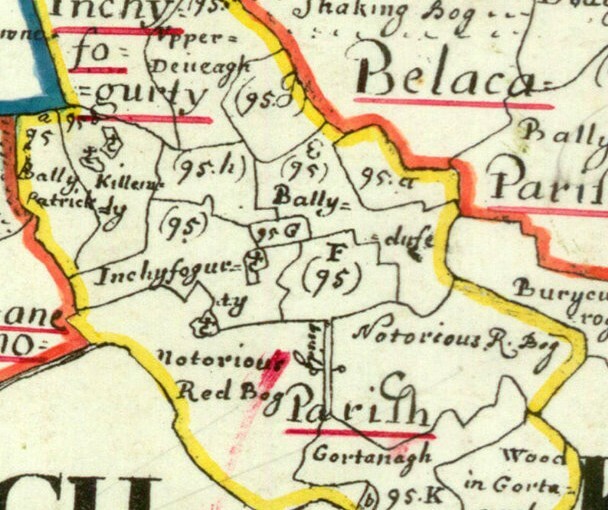 is returned as the principle land owner of Ballingarry townland (Pender, S. 1939 Census of Ireland c. 1659. Dublin. 295). In 1667 Jeffry Fanning paid taxes for three hearths, including an oven and a kiln (Laffan, T. 1911 Tipperary Families, Being the Hearth Money Records for 1665-7. Dublin.135). 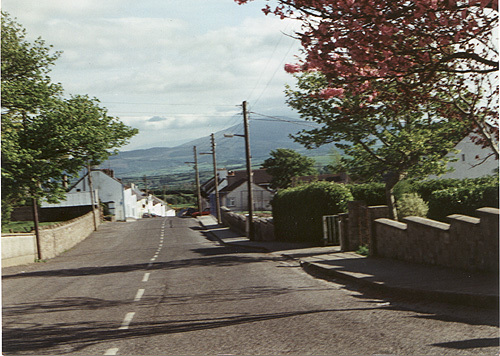 The area occupied by Ballingarry settlement was small. The historical record and the remains on the ground show that the settlement was dominated by the Fanning tower house and other buildings owned by them. 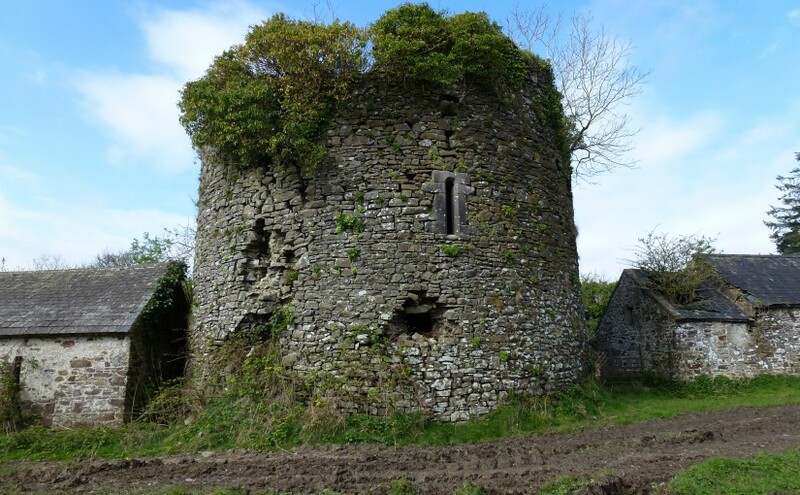 The Fannings were associated with Ballingarry from the early sixteenth century, possibly when they built their tower house. The choice of site was influenced by the presence of the parish church. 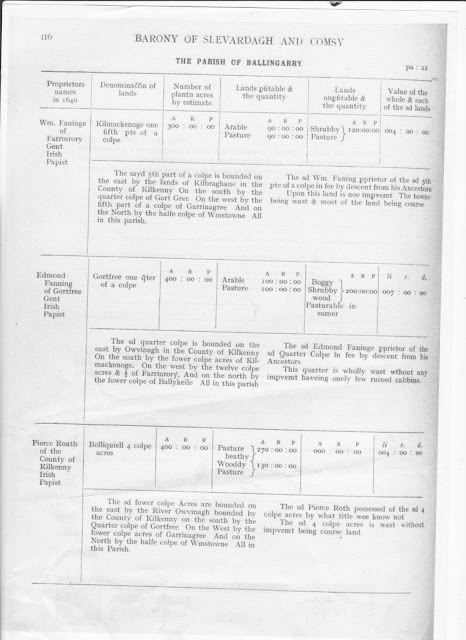 The settlement described in the Civil Survey appears to be a wealthy farmstead with services and functions for a grazier estate. Any nucleation at the centre of the parish was sponsored by the Fanning family, either for their own use, the functions of the estate or as houses for the workmen of the estate. The Catholic people of the Parish built a new Church at “Kilbaheen”, situated 250 yards east of the present church, in 1731, on land reserved by Mr. Fanning when he sold his property to Mr. Jacob (Visitation Book, pp133-134). Ortelius’s Map locates this family in the Barony of Pobble-Brian, County of Limerick; and the name is of record in Ireland from the time of Edward the Second. 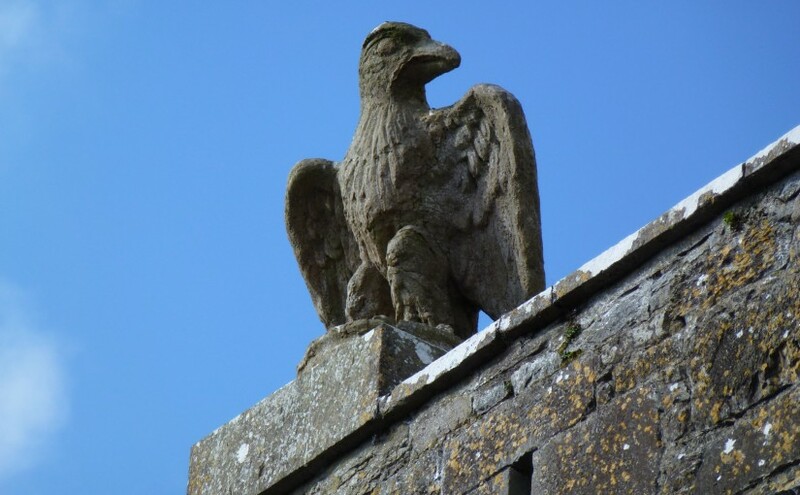 In 1346 John ‘Fanyn’ was one of an influential Commission deputed to examine the fitness of the guardians of the peace and the adequacy of the array in the County Limerick, and Simon ‘Fanyng’ is of record, as a landed proprietor therein in 1355. In three years after Hugh Fannyn was appointed a guardian of the peace and commissioner of array in Tipperary. 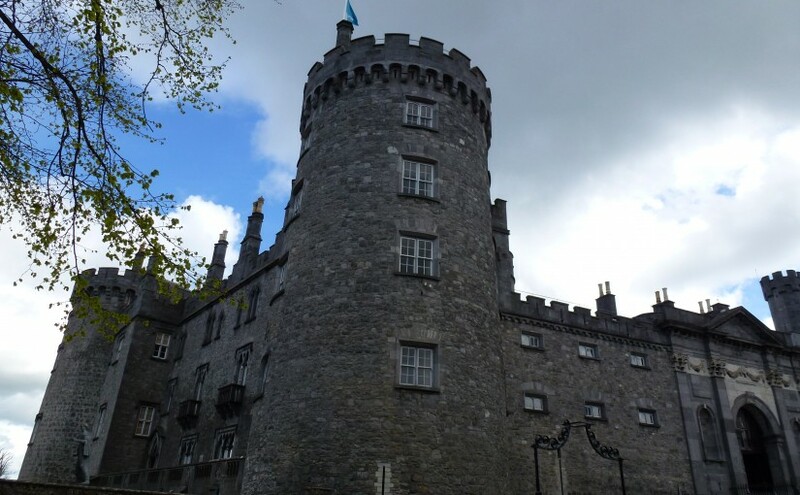 It was a name of influence also In Kilkenny, where, in 1545, Henry the Eighth granted the fee of certain lands to Oliver Fannynge, whose son and heir died in 1623, leaving Robert, his son and heir, then aged thirty and married. 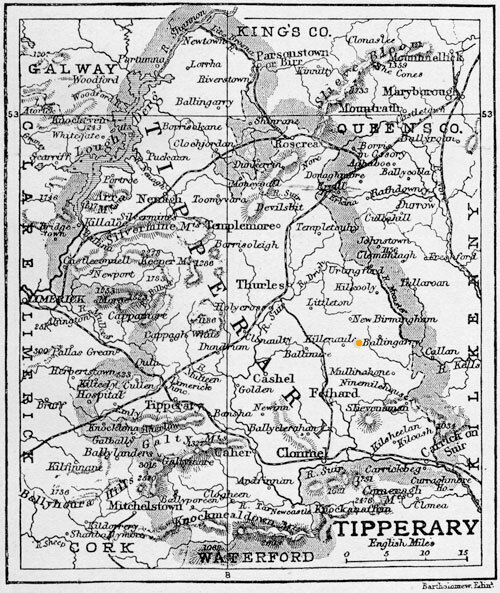 Again, in 1590, died William Fannyng, having made a previous settlement of his estates there, the trustees of that settlement were James, son of Thomas Fannyng of Ballintaggart, in Tipperary; Robert, son of Walter Fannynge of Mohobber, and Richard Fannynge of Kappaghintallagarry. James was the son and heir of said William, the settler, but he, dying in his father’s life-time, William Fannyng succeeded, his namesake’s estates. 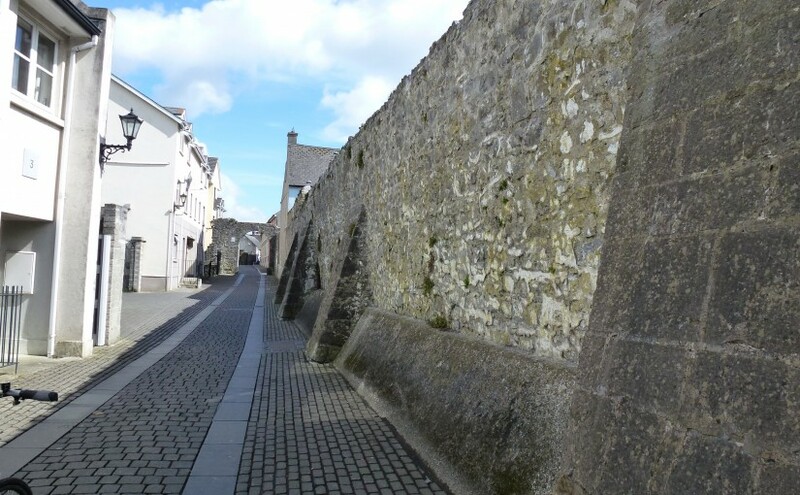 In 1632 a Robert Fannyng died seised of several lands in Kilkenny, and leaving William, his brother and heir, then aged thirty-three and married. * Clarke’s Correspondence. MS8. T.C.D., Lett. 83.